Recognized by BFG in 2008 as an Outstanding Trail. 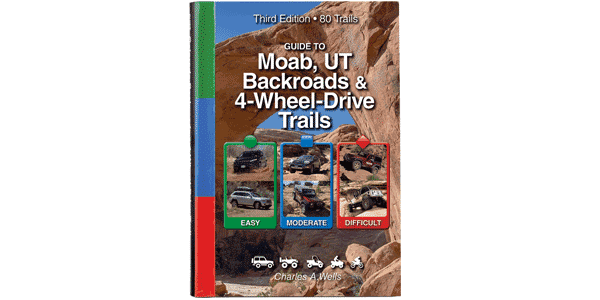 We would add, “assuming you have the right vehicle and skills to drive it.” The start is close to Moab, but it’s a long drive back after you’re done. East side of canyon is wilderness study area. Stay out or risk closure of this great trail. UTVs, ATVs, and dirt bikes are legal, but check your sanity at the gate. Extremely difficult. For big, customized, hard-core rigs only. Huge, off-camber ledges lie in wait for drivers too proud to winch (winch points on Chewy Hill, Rocker Knocker, Axle Hill and Yellow Hill). We left our modified 2-door Rubicon at home and wisely rode with Moab Friends for Wheelin.’ Study YouTube® videos before you go.